We’ve been exploring some of the practical issues working artists face in their creative careers. We asked curators, arts leaders, and visual artists: What’s the first thing you’d tell to an artist looking for new opportunities to present his or her work? It’s best to start slow and have a clear objective. I encourage artists to focus on gaining exposure rather than putting their energy into immediate financial success. Developing a proper foundation and being able to self promote is key for any serious artist. Social media and websites are important tools for today’s artist. When approaching curators, galleries and creative spaces, artists need to remember they’re on an interview, so be prepared. Learn about the organization’s mission as this will help clarify if an opportunity is good for you. Group shows, open critiques and reviews are some of the best ways to gain exposure and build your network. Be present, enjoy the experience and take risks since unknown opportunities may be on the horizon. It is about building relationships with curators. It takes time, and success does not usually happen overnight. An artist today has to be able to market his/her work, yet at the same time be mindful and respectful of a curator’s time. I often encourage artists to keep me informed through exhibit postcards or emails. I don’t want to get an email every week but once every three months is not intrusive to me. An artist should ask how a curator would like to remain informed. I also encourage artists to take part in opportunities that provide exposure for them. Portfolio reviews, auctions and group exhibitions are good ways to begin to get work out into the public sphere. Today it is imperative for any serious artist to have a website that is current and presents work in an informative way. Carolyn: Communicate with other artists and/or collectives. Do research; see where and how other artists are presenting their work, locally, nationally and internationally, through websites, blogs and art openings. This is why I love being part of a collective – everyone shares what they know and it creates immense room for rapid growth both artistically and art career wise. Something I constantly do is research other artists. If I get into a show, I look everyone up, especially when I like the work, or it’s similar to mine. I read their statement, bio and artist resume. Perhaps they’ve been part of a biennial that’s right up my alley. Or if it’s a local artist, maybe they’re part of an interesting collective or they’ve shown at a nearby gallery that specializes in emerging artists that I haven’t heard of. Sometimes it’s not about new opportunities as much it’s about your communication skills. Every showing artist needs a contact list, in short, people that enjoy your work and will show up to an event. I’ve seen artists have great opportunities and almost no one shows, and I’ve seen artists show at pizza shops/cafes have an amazing turnout and sell almost everything. Communication is key. Stephanie: I would first think about how you want to be portrayed in the public eye. Is it a DIY underground vibe you’re after or are your eyes set on high art spaces? It’s not unattainable to aim high but it’s easier to start with more feasible venues. There are so many cafes, restaurants, and other venues to host work at besides the traditional gallery scene. I think starting there helps with the building blocks of how to communicate with your audience, the curator, and how to present yourself as an artist to strangers. You learn a lot, surprisingly. I have two vantage points – one as an artist and one as a college gallery curator, and my opinions and actions are influenced by both of my positions. As a curator, I really appreciate a submission that is very organized. There should be a well-written polite cover letter addressed to the correct person with correct spelling. Artwork examples should be good images that are described well and in detail in an image list. They should not be folded and wadded up inside an envelope that is too small. I prefer to receive a physical submission rather than through email, however I do look at websites that artists refer to via email. As an artist, I think it is important to represent yourself professionally with a clear and concise submission packet. Follow submission criteria or you could be disqualified. Make sure the venue is right for your work but send as many submissions out as possible, knowing that one will eventually be welcomed. Make sure the work is consistent and the images are good representations. From both angles, quality is what rings true, even when taste wavers. 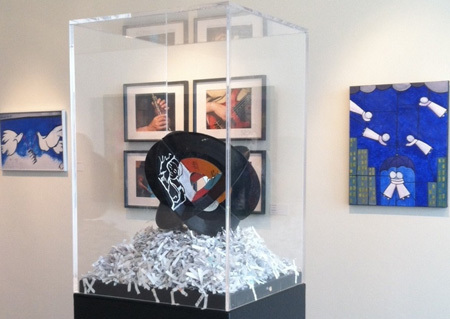 Image: Installation view of VISUAL LYRICS, the November 2011 show at UFORGE Gallery. UFORGE uses an innovative monthly assignment model to spark creativity and encourage unique art submissions.